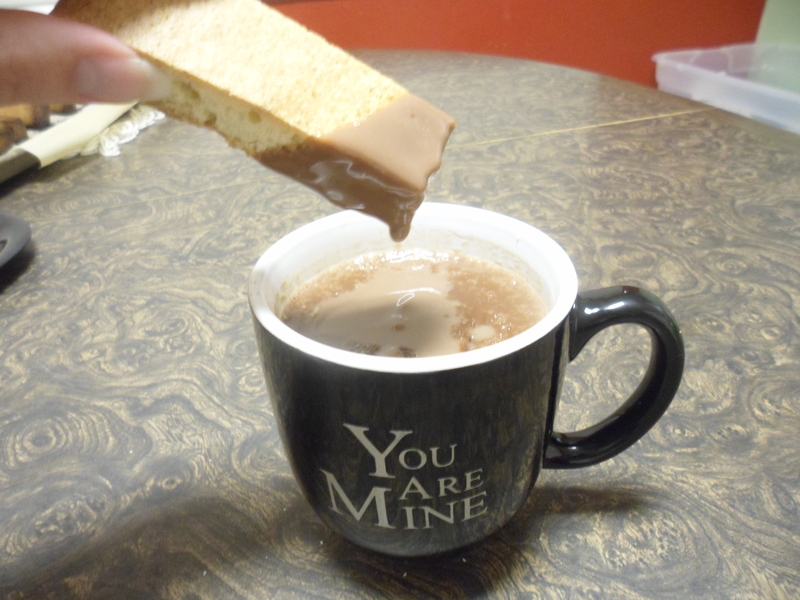 For anyone that has read You Are Mine, you know that Serena likes drinking hot chocolate, often accompanied by a biscuit. Biscuits and chocolate. I devour them, not even taking the time to dunk the thin, sweet wafer in my thick drink. Chardonian biscuits are a type of biscotti. If you’ve never had them before, what are you waiting for? They’re super tasty , and I love them dipped in nice, thick Chardonian hot chocolate. The original recipe is from Allrecipes, but has been modified for a more Chardonian taste. The biggest change is using vanilla flavoring instead of anise, but if you like a licorice sort of flavoring, then by all means, go with the original recipe. Since hot chocolate season is starting again, I thought it’d be the perfect time to share the recipe. Enjoy! Recipe derived from Biscotti Recipe on Allrecipes. They also have a video on their website that does a great job showing you how to make them. Place half of the dough on a parchment lined cookie sheet in a log the length of your cookie sheet. Roll out to 1/4″ thick. Repeat with the other half on its own cookie sheet. Bake 25 minutes or until golden brown. When cool enough to touch, cut into 1/2″ sticks. Toast in the oven an additional 5-8 minutes on each of the newly cut side. When cool enough to touch, dunk in Chardonian Hot Chocolate and enjoy! Yum-o! I love biscotti. This sounds like a great recipe! 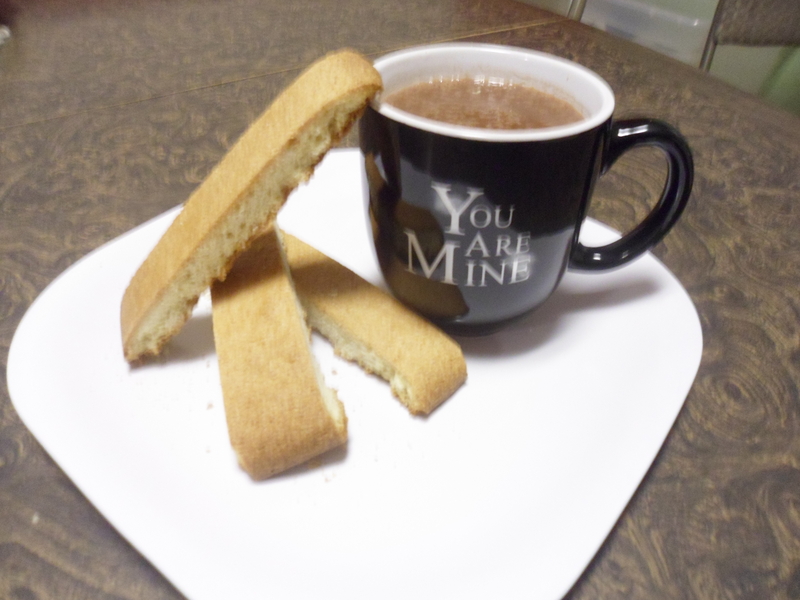 i used to make homemade biscotti all the time, and I gained like 20 pounds from it … so sadly I had to back off. But it’s such a treat! Sounds like a perfect combination… who doesn’t love hot choc with a cookie…:) Really like the look of your recipe… might have to give it a whirl. Oh, and loving your mug… so cool.